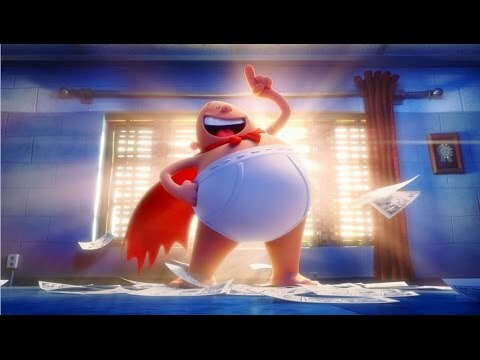 Based on the series of children’s novels by Dav Pilkey, Dreamworks Animation are bringing Captain Underpants to the big screen, and the first trailer shows is here to let us know what we’re in for. Setting it’s sights clearly on skewing the super hero genre, while also being a super hero movie in it’s own right, the movie concerns two fourth grade pranksters (Tom Middleditch and Kevin Hart) who trick their overbearing principal (Ed Helms) into thinking he’s a caped crusader, Captain Underpants. Running around in just his underwear and a curtain turned cape, he attempts to fight crime while having no real powers or crime fighting skills to speak of. Captain Underpants looks to be a hell of a lot of fun, with the cutesy, stylised animation (based on Pilkey’s own drawings) actually looking quite gorgeous in some places. On top of that, the humour is perfectly played, with the movie promising to get plenty of milage out of the super hero satire. With 12 novels existing in the series, Dreamworks potentially have a new franchise on their hands.